Nithu's Kitchen : Tell us about you Brindha. Brindha : I am a chennaite... Got married and now residing in US. Did BE in Electronics and Comm. Worked for 2yrs in a company and left it after marriage. On coming here, I was helping out my Brother in his business works. Nithu's Kitchen : What was the very first dish you cooked. Brindha : First dish ever tried was Kesari with my mom beside me. Basically it was like, my mom was cooking through my hands :) So, obviously it turned out good. In retrospect my mom was so happy as if I made the sweet :) After marriage I did kaara kuzhambu and carrot poriyal. Practically, I would call this to be my first ever dish tried, as I did it without any help or assistance. Nithu's Kicthen : What did your husband say after tasting your dishes. Brindha : He liked it. Till date he never complains about my cooking (even if its not up to the mark:) ), but he just recalls how slow I was earlier and how much my speed had had increased. Seriously, thanks to my MIL, on seeing her speed I improved a little. Nithu's Kitchen : Share us one of your unforgettable kitchen mishaps. On that day my MIL cooked avial and daal in a cooker with separate container. I thought both has to be combined together and did so. Then my MIL told me in Aviyal, daal will not be used. She was so sweet and took it sportively. Everyone ate it saying this is just Aviyal with daal :) So nice of them. 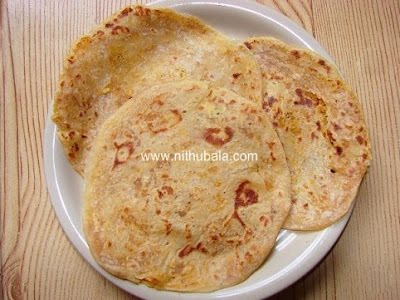 Nithu's Kitchen : :-) Guess, our friends here have got a new recipe for avial to try. What do you have today to share with us. Do you have any special reason to select this specific dish today? Brindha : I'm sharing the recipe for Poli. Its my favorite sweet dish and my hubby's too. I would always crave for it when I was in Chennai. So this is an attempt to bring the feel of being back at Home. Soak Channa dhal over night. Drain out water. Pressure cook dhal without water, in an uncovered container. Grind the cooked dhal in mixer without adding water, to a powdered consistency. Dilute the jaggery and filter it to remove dirt. In a wok sauté coconut and then add the diluted jaggery to this. After stirring for a minute or two add the ground dhal and powdered cardamom. Stir well till it forms a semi-dried consistency. To Maida add little salt and required water to make dough. After mixing well start adding oil in small increments and mix well till all the oil are added. This will form soft dough. Let it rest for 2~3 hrs. Take little dough and stuff channa mix into it. Roll out into flat bread, like Roti. In a heated pan, cook Poli on both sides with little Ghee. Friends, hope you all love Brindha's traditional and yummy Poli. If you are interested to be featured as Nithu's Kitchen's Guest, please drop a mail to nithuskitchen[at]gmail[dot]com. அறிமுகத்திற்க்கு நன்றி நிது!! பிருந்தாவிற்க்கு இனிய மணநாள் வாழ்த்துக்கள்!! Good to know more about Brindha!Loved her poli,which is one of my fav's too! Poli sounds inviting with excellent click.. Wedding Anniversary wishes to brindha .It was good to know more about you .Poli is so appealing .Hats off to nithu for this guest post sections. Poli looks soft and yummm! Glad to know abt brindha...thanks nithu!! yummy poli!! Looks and sounds awesome! I love Poli's! My wishes to Brinda on their wedding anniversary. Lovely poli. Interesting interview. Thanks to both. Happy Wedding Anniversary Brindha & Vivek. Happy Anniversary Brindha and thank you Nithu for giving such a nice intro of Brindha. Good interview with a nice recipe. Thank you. Great post, Nithu..It was really nice knowing about you, Brinda..Happy anniversary!! Poli looks great!! Nice pic.. Thank you brindha for sharing the recipe and the poli's :) I should say it not only looks good but tastes excellent :) I like her brownies very much. Nithya I loved your blog, so many wonderful dishes..Grt job! !